If your design puts a lot of ink onto the paper, our quick turnaround means that your job would not have time to dry before it is cut which may result in ink transferring from one side to the other (known as set-off). Your job might even begin to adversely affect other jobs printed at the same time. For this reason, our automatic File Check software will reduce any ink limit that exceeds 300% for Coated and 240% for Uncoated Paper Stocks ('Ink Reduction Applied' will appear on your shared File Check Results email when this process has occured). By controlling your Ink Levels, you can ensure the best possible results from your photos and graphics. You’ll also run into fewer color shifts, delays due to proofing/resupplying and possible quality issues. For coated papers (gloss and silk, but not bond or most other stationery papers), you can use colours made up from more than 225% but less than 300%. The thickness of the card means it requires a little more pressure to cut them. We recommend keeping ink levels below 225% and avoiding large blocks of colour that bleed to the edge. This product is interleved to avoid set off. 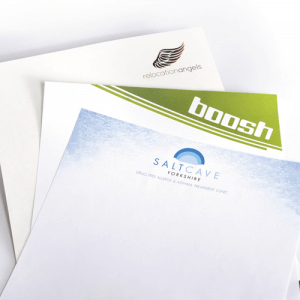 The maximum ink level for Double Sided 80gsm Letterheads is 225%. We recommend keeping ink levels lower than this to help avoid show-through. Process Colours are created by selecting a percentage of 0 to 100% per CMYK Colour Channel, for example 75% Magenta and 25% Black (K). The ink limit is the value you get when you add these colour channels together (75m + 25k = 100%). The maximum ink percentage you can create is 400% (100% C, 100% M, 100% Y, 100% K). We have a dedicated Central Support Team, who are based at our UK production facility. They are available Monday to Friday to answer your questions on our products, prices, specification and file supply. or via our online chat facility at the bottom left of this website.